Today is a special radio special! Part One: Is about 9/11 (Our Hearts and prayers go out to the families) and the feelings that linger still. 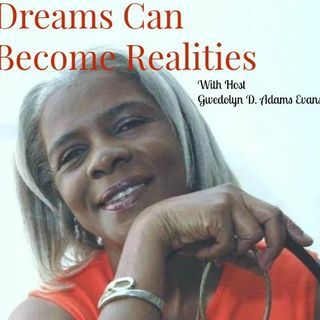 Part Two: Is about our wonderful and beautiful Host Gwendolyn D. Adams-Evans who proves Dream Can Become Realities for everyone no matter what you endure in life. As everyone knows today is 9/11 and our hearts are still heavy from what happened in 2001 atThe World Trade Center and The Pentagon. So many people lost their hopes, dreams and lives for the ... See More future. Many left behind wonderful families who had to deal with the harsh reality that life would never be the same for them without their loved one. Host Gwendolyn D. Adams-Evans has done so much in such a short time overcoming personal tragedies and still moved forward. Gwen has been helping people since her career started by guiding them, putting up money into their projects, working on their projects and more. She has come across good and not so good people and still manage to stay positive. Hear her story!